Occasionally, the decision making that surrounds euthanizing a pet is pretty straightforward. In cases of massive trauma, severe illness or unrelenting pain that cannot be managed, the path seems clear. In other cases, however, it can be hard to know what to do. The feeling that “it’s time” can be more obvious in some situations than in others. But no matter how clear-cut the case may seem, a decision to euthanize a beloved pet often still involves a slew of conflicting thoughts and emotions. Making reasoned choices for our pets in such situations is often agonizing — and maybe that is as it should be. It is no small thing to end a life, and each instance must be approached with care and deep respect. Clients often talk about their struggle to find the “right” time. (Veterinarians face this same issue themselves with regard to their own animals.) Few people want to “jump the gun” and end a life too soon. On the other hand, most of us would be horrified if we waited too long and our pets suffered needlessly. So how do we navigate euthanasia decision making more easily? When the information we have seems clear, but we just can’t wrap our minds around making a decision, what do we do? And what do we do if a veterinarian (or well-meaning friend) suggests euthanasia as something to consider when it hasn’t even been on our radar to begin with? That can be an emotional shocker. Deciding to euthanize a pet is never easy. This is particularly true when finances, time constraints, physical limitations to providing care, unexpected events, or a need to prioritize the care of our human family trumps our desire to care for our animals. We can feel tremendous guilt, helplessness and sometimes even resentment toward the things and people that we think are standing in the way of what we’d like to do. Sometimes life is so busy it seems there just isn’t time to stop — to take the time we really need to face up to the decisions we must make. And then sometimes it seems there simply are no good choices, no matter how much time we may have. Having people who can listen to your concerns and questions, and help you sort through things as objectively as possible, can be invaluable. This can then leave room for tackling the equally important emotional issues attached to losing a loved one — in this case, an animal companion. Your veterinarian can help you with the medical questions and also support you by acknowledging how tough these decisions are. But sometimes the questions related to our emotional attachment are the ones that can be the most important to address because, if not, these emotional factors can be the things that blind us to the reality of our pets’ conditions. Hard as it may be, we have to acknowledge the realities of our situation. There are “quality-of-life scales” out there that have been popularized, but none of these have been scientifically evaluated or validated. So while they can give us ideas about what we need to consider when we walk down this path, they should not be used as cookie cutter guides for our euthanasia decisions. There is too much individual variation in circumstances. For most people, there are things other than the pet’s actual medical condition that must be considered. From financial resources to time available to care for an ill pet or the physical limitations of caring for a disabled pet — there are often multiple bits of information to process. Guilt can confuse things even further. In an ideal world, we would all have enough money and time and the right floor plan and the physical strength sufficient to provide any level of home care needed. For some animals — for instance, my own cat — even administering oral medications is not possible. 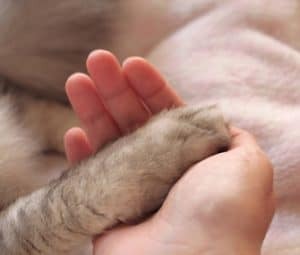 It’s not ideal, but it is real, and it is the reality of our individual situations that is the foundation for making reasoned decisions about what to do with a seriously ill or dying pet. Subtle changes (weight loss, arthritis, increases in water drinking, etc.) can be so gradual as to be unnoticeable to us, since we are around our pets daily. Even significant declines in health may not be recognized by you — but may be by a caring friend or by your veterinarian. The observations of others can help us see the reality of a situation more clearly, especially when it comes to pain and loss of function. Be open to this input; resist the urge to block it out because it might be something painful you don’t want to hear. Listen to the assessment of your veterinary team or friend, and weigh what you’re seeing with the information you’re being given. Two of the most common quality-of-life issues that clients often struggle to recognize in their pets are pain and nausea. Your veterinarian can help you more fully understand what is going on with your pet. Medicine is all about teamwork. Establishing relationships of trust and understanding with your veterinary medical team can help you feel more comfortable with the advice that is being given. It is important that you understand all of the factors that influence a recommendation from your veterinarian. Write down questions you may have as they come up, so you can remember to get them answered. Ask for clarification about anything you don’t fully understand. Consider scheduling an appointment to speak with your veterinarian about euthanasia without your pet present, so there is less distraction. Have a friend accompany you to take notes, or ask your veterinarian if you can record the conversation so you can review it later to make sure that you heard — and processed — everything. Be honest about your concerns, questions and confusion. Get a second opinion if you think extra information or another set of eyes might make things clearer for you. Speak with a counselor if there are emotional or psychological factors that could be keeping you from being able to make decisions or fully accept what you are being told. Part of letting go is recognizing what it is we stand to lose. There are, of course, physical benefits of pet ownership. And maybe, more important, our pets seem to provide many things we, as humans, crave yet are not able to provide to one another: unconditional acceptance and love, unwavering support and unqualified appreciation for who we are. Losing this type of love and connection can be the worst loss some will ever experience. Take time to honor the unique relationship that you will be losing. At times, the last, best gift of love we can offer our beloved animal companions is release from torment. If your primary focus is truly your pet and their comfort, and your decision is made from a heart of love, you will make the right choice. Why do we get so grief-stricken at the loss of a pet?